리눅스 명령어인 "top"과 같은 것입니다. Ver 3.22.x, 3.23.x, 4.x 서버 등의 총체적인 수행과 쓰레드 등을 모니터링하기 위한 text기반의 툴입니다. 그것은 Perl, DBI, Term, Term::ReadKey가 인스톨된 환경에서 실행됩니다. (2) 그것이 무엇이며, 어떻게 인스톨 하는가 ? mytop은 길고 짧은 커맨드 인자를 처리합니다. Mysql 서버에 로그인하여 사용되는 유저 네임. Default: ``root''. Mysql 서버에 로그인하여 사용할 패스워드 Default: none. 패스워드가 걸려 있으면 당연히 -p 옵션을 줘야겠죠. 호스트 네임은 포트 번호를 같이 적을 수 있습니다. Default: ``localhost''. 비 표준 포트로 Mysql을 운영한다면, 포트 번호를 명시해 주십시오. Default: 3306. 사용자가 지정한 데이터 베이스를 사용하기 위해 사용되며 디폴트는 "test" DB입니다.''. 배치 모드에서 mytop은 딱 한 번 실행이 되고 화면은 클리어되지 않습니다. 라인 수와 관계없이 무한대로 출력합니다. 이것은 지속적으로 수행되고 있는 상태 값 정보 등을 캡처하는데 적당합니다. * 해석이 애매해서 원문 올립니다.. 지송. 해석되면 제게 메일좀..
and places no limit on the number of lines it will print. This is suitable for running periodically (perhaps from cron) to capture the information into a file for later viewing. 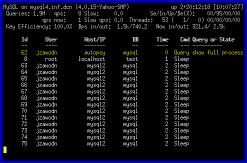 You might use batch mode in a CGI script to occasionally display your MySQL server status on the web. Mysql의 호스트와 같이 유사하게 mytop을 실행할 경우, 표준 TCP/IP 연결보다도 오히려 Mysql 소켓을 사용하는 것이 좋은 겁니다. socket을 지정하였을 경우, 호스트나 포트 혹은 개별적으로 mytop을 거부할 것이다. 소켓이 존재 하지 않거나 소켓이 아닌 파일이 지정되면, 이 옵션은 무시되고, 기본적으로 호스트 네임과 포트를 사용할 것입니다. If you're running mytop on the same host as MySQL, you may wish to have it use the MySQL socket directly rather than a standard TCP/IP connection. If you do,just specify one. Note that specifying a socket will make mytop ignore any host and/or port that you might have specified. this option will be ignored and mytop will use the hostname and port number instead. 헤더에 출력은 하던 하지 않던 간에 mytop이 실행되는 동안에는 "h" key로 토글된다. 컬러사용. 하지만 터미널이 컬러를 지원되지 않으면 소용이 없습니다. 디폴트로, 컬러 지원을 설정하면, mytop은 컬러 지원을 시도한다. "idel" 쓰레드가 out되면, 디폴트로 가장 오래 대기하고 있던 실행 쿼리가 리스트의 최 상위로 올라갑니다. If sleeping threads are omitted, the default sorting order is reversed so that the longest running queries appear at the top of the list. 부피가 큰 커맨드 인자값 등을 적는 대신, 개개의 디렉토리의 ~/.mytop 환경 파일을 사용할 수 있습니다. 다음은 mytop이 실행 중일 때 나타나는 여러가지 액션들입니다. 특정 데이터베이스에 연결되어 있는 쓰레드를 보여 줍니다. 주어진 쓰레드 ID, 쓰레드가 실행되고 있는 query 값을 출력합니다. Disable all filtering (host, user, and db). 특정 호스트에 대한 query 등을 보여준다. 기본 실행 환경인 config 파일에 설정되어 header=0 또는 header=1 을 지정할 수 있다. 토글모드, 현재 "top" 모드에서 "qps"로 스위치 값을 옯깁니다. 이 모드에서 mytop은 2초 당 한 정수(integer)를 기록합니다. Toggle modes. Currently this switches from `top' mode to `qps' (Queries Per Second Mode). In this mode, mytop will write out one integer per second. The number written reflects the number of queries executed by the server in the previous one second interval. More modes may be added in the future. 지정한 유저에 대한 쓰레드만 출력한다.